The original drawing (above) of the brain… from one of my notebooks. In a painting of the same scene, I added tentacles to the brain. I think if I were to redo this, I might skip the tentacles… but then what would the adventurers be doing around the pool? 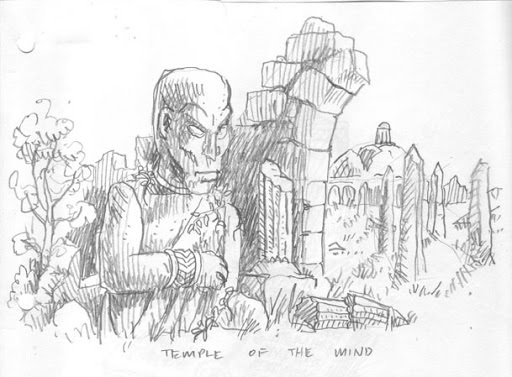 The ruins of Tana Tak are strewn with ancient statues of an unfamiliar humanoid race with oddly shaped eyes. No one (other than perhaps ‘the mind’) knows if these are supposed to portray the original inhabitants. The above picture shows a trail through the ruins to the dome. A map/view of the ground floor and upper level of the dome. The upper level is equipped with bookshelves that have been mostly looted but might still contain a few of the ancient texts of Tana Tak (see below). 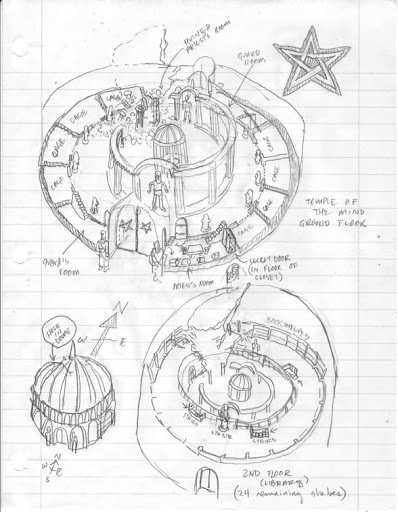 An isometric view of the cellar level of the dome. 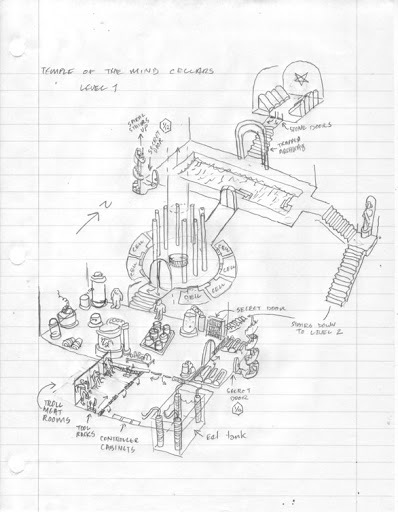 In the center is a round chamber with pillars equipped with a well that contains the brain. The cells around the well house some of the brain’s guards and lieutenants. North of that is a room with a large pool, some staircases and a room of mysterious powered coffins that may contain the remains of some ancients. South of the temple of the mind is a laboratory maintained by the mind’s servants. The various electronic devices are powered via a tank of electrical eels that are fed via an ingenious ever-renewing supply of troll meat. The captive trolls are quite insane from constantly having bits hacked off to feed the eels, then being allowed to have those bits hacked off again, etc. 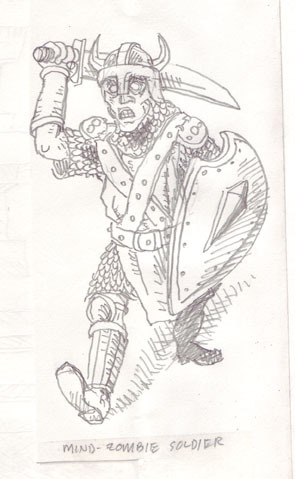 A “mind zombie.” Note the vacant stare and ancient armor and weapons. I haven’t decided if someone who has been converted to a servant of the mind can be converted back. I’m imagining not since I envision the process similar to some sort of lobotomy. The ruins themselves are overrun by ghouls that emerge from the rubble and crypts beneath the city at night. The denizens of the temple like the fact that the ghouls discourage most visitors and the ghouls do not seem to bother the temple. The ruins were once famous for the books found there; unfortunately, due to their value, many of the books have been plundered (and are sometimes found for sale or in hoards hundreds of miles from Tana Tak). The pages of these books are usually sheets of thin hammered copper, gold or silver engraved with mysterious symbols. The ‘pages’ are usually bound together with rings. Sadly, many of the books have been plundered for the value of the metal from which they were made and were subsequently melted down for bullion. If means can be found to translate the symbols (some spells will work), some of the books apparently record unusual magical formulas. This map of “The Northlands” has some of the names for regions/kingdoms I was considering at one time. Yes, we have kingdoms named “Amnesia,” “Catatonia,” “Moronika” and “Dementia.” Did I mention that Alluria is occupied by Amazons? It’s true! 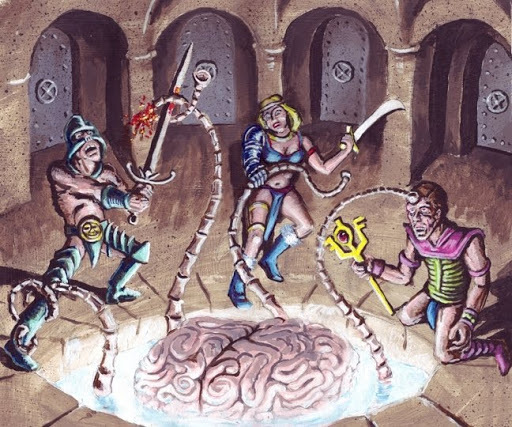 Very cool lighting and character design in the painting of the tentacled brain. What medium did you use? How big is the work? Acrylic. I did it a few years ago and it is currently in storage (so I can't easily measure it) but I think it is 16×20 or 11×14? I like that painting. It reminds me of the climax of that Moorcock story where the four Eternal Champions team up to fight a living cross-dimensional tower. I love this just so much… The art, the description, everything. Very C.A. Smith. Thanks for sharing! Made my day.